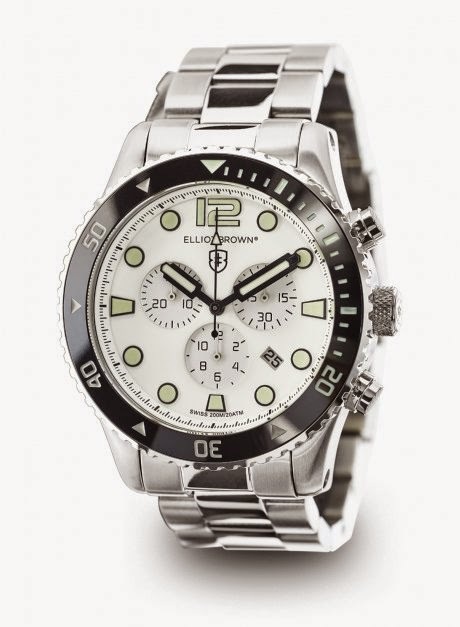 British watch maker Elliot Brown have just announced the outcome of a unique six month ordeal that they put one of their watches through. A £550 Bloxworth 929—007 watch was submerged at the bottom of Poole harbour for half a year to simulate the kind of stresses an average wrist-based timepiece would go through over 12 years of everyday use. The results... startling. You might think six months in near-freezing salt water would completely ruin even the hardiest of watches, but the Elliot Brown unit is, after being retrieved from the murky depths, still happily ticking away and keeping the correct time. Although immediately after being saved from further attacks by fish (and thieving scuba divers) the watch seemed to have rusted through, this was merely surface scale which has been cleaned off to reveal the pristine metal finish. Crystals: a 16.5g ball bearing is dropped from half a metre above the glass three times to check it’s hardened and tempered correctly. Pushers: Each pusher is pressed 5,000 times to simulate years of wear and tear. They must function perfectly after the test and feel the same when pressed – no stiffer, no looser. Strapping: The ends of the leather straps are clamped down and the strap is flexed in half then stretched out 5,000 times to ensure the leather won’t crack. A 1kg block pressing on a felt pad is dragged backwards and forwards across the surface 150 times dry and 150 times soaked in water to ensure there’s no loss of colour. Every type of strap in the range (leather, bracelet, webbing, canvas) is subjected to a traction and torsion test – a 5kg weight is hung from one end of the strap whilst the other end is repeatedly twisted back and forth through 180 degrees 5,000 times. Water-resistance: Every watch case is pressure-tested in air to 75% of the stated water-resistance - 150m or 15 bar - when they are manufactured. Air-pressure is used instead of water because it’s non-destructive and faster than water-testing. After the watches have been fully assembled, they are pressure-tested again to 150m in air to make sure they’re able to withstand full ‘wet’ pressure-testing. Pressure testing watches individually is time-consuming and expensive, which is why brands often only test a few watches from each batch. Every completed watch is then wet pressure-tested in a 30cm-deep steel pressure vessel of water to 20 bar/200m for 10 min, and then placed on a hot-plate at 40-45c for 15 minutes. A drop of water between 18 and 25c is placed on the glass, and after a minute, the watches are wiped dry and checked for condensation under the crystal which highlights any leaks. Shock-resistance: A percentage of every batch is tested for shock-resistance by striking them twice with a 3kg pendulum hammer - once on the left-hand side of the case and once on the crystal, which simulates the impact the watch sustains if it falls from 1m onto a hardwood floor. As an additional real-world test, a selection of watches from every batch is dropped 4 times in succession from a metre onto a hardwood surface. Timekeeping: The assembled watches are put through a ’burn-test’ for 24 hours in 4 positions – face-up, face-down, crown-up, and crown-down, to test for timekeeping issues.